The second match of the session was another that went all the way to a decider as New Zealander Matt Edwards overcame Poland’s European Champion Konrad Juszczyszyn. The match was riddled with errors as both players missed countless pots but that only seemed to add to the entertainment. Juszczyszyn lead 6-3 and with the break seemed to have it in the bag. With both players under par, Edwards got back to the table and clawed back two racks. At 6-6, he found himself breaking for the match but failed to down a ball. The Pole scratched playing a safe on the one-ball to give Edwards ball in hand. Under immense pressure, the New Zealander held his nerve to run the table and keep his Masters dream alive. 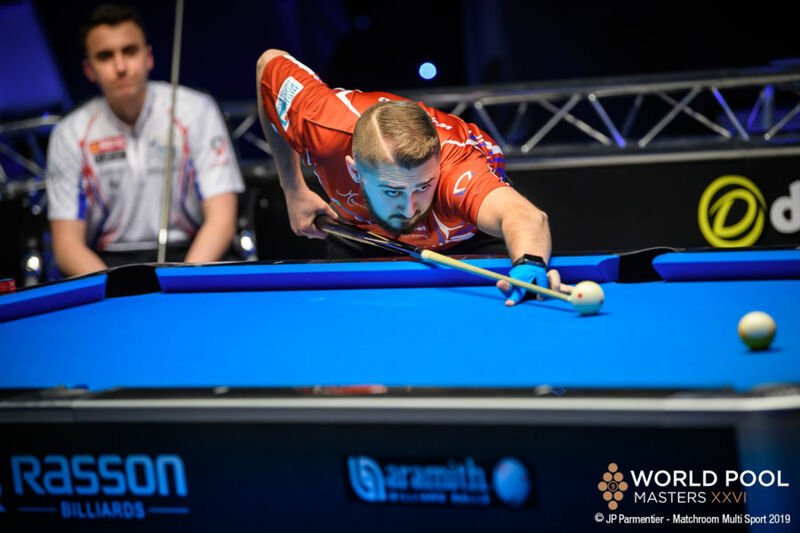 The penultimate match of the session saw two World 9 Ball Champions collide as reigning champion Joshua Filler squared off against Albin Ouschan, the 2016 winner. It was nip and tuck all the way as both players performed well and it was a glaring error from Filler that decided the match. He lost his concentration momentarily trying to complete an elementary pot on the six-ball and it went awry, leaving it on for Ouschan. The cool Austrian completed the run out to reach Sunday afternoon’s quarter-finals where he will face Skyler Woodward who defeated Fedor Gorst in the final match of the evening.